The retired gunfighter who must return to his bloody business one last time. The hotheaded youngster who must back up his bragging when push comes to shove. The small-town sheriff who must face down the hired killers riding his way. The brutally wronged woman who must rely on the firepower of a steel-eyed stranger. Unforgiven – slated to screen at 7:30 p.m. Saturday and 7 p.m. Sunday at the Museum of Fine Arts, Houston as part of MFAH’s “The Modern West” series -- abounds in the time-honored stereotypes that have been the staples of Westerns since the heyday of Tom Mix. Which isn't at all surprising, considering the Best Picture of 1992 came to us from Clint Eastwood, who played a major role in demythologizing many of these elements for the better part of four decades. First as an actor, in such films as A Fistful of Dollars and Hang 'Em High, and later as his own director, in star vehicles such as High Plains Drifter and The Outlaw Josey Wales, Eastwood upended clichés, sullied stereotypes, and challenged assumptions — sometimes in dead seriousness, sometimes with sardonic humor. In his Oscar-winning Unforgiven, however, Eastwood ventured even further into the dark underside of the Western mythos, and to the very top of his form as an actor and filmmaker. But here’s the killer irony: Unlike most classics that earn their exalted status by launching or defining a film genre, Unforgiven may have actually ended a genre. Since its release in 1992, there hasn't been a Western of any true significance, arguably because, in the wake of Eastwood's magnum opus, there's nothing left to say, nothing new to add. In a terrific cast, Eastwood is first among equals as William Munny, a gunfighter once feared as "a man of notoriously vicious and intemperate disposition." He was reformed by the love of a good woman and domesticated by the demands of a pig farm and two children. Unfortunately, as Unforgiven begins, Munny's wife is two years dead, the pig farm is failing—and Munny's worried about how he will provide for his offspring. Meanwhile, off in the remote town of Big Whiskey, Wyoming, the local sheriff, Little Bill Daggett (Gene Hackman), maintains law and order with a whim of iron. Two drunken cowboys cut up a prostitute in a late-night fracas, and the other hookers demand prompt, equally brutal justice. But Little Bill merely orders the cowboys to pay a fine of six horses — to the owner of the bordello, not to the disfigured prostitute herself — and lets it go at that. "It's not like they were tramps, or loafers, or bad men," Little Bill explains. So the prostitutes, led by the fiery Strawberry Alice (Frances Fisher, once Eastwood’s off-screen significant other), pool their savings to raise a $1,000 bounty on the two cowboys. In no time at all, a hotheaded (but, alas, nearsighted) youngster named The Schofield Kid (Jaimz Woolvett) shows up at Munny's door, seeking Munny's help in collecting the reward. Although initially reluctant, Munny unpacks his guns and approaches another retired gunfighter, Ned Logan (Morgan Freeman), to suggest a three-way split for the blood money in Big Whiskey. 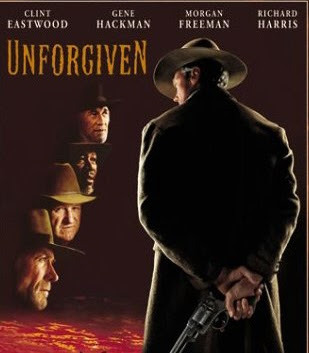 For a revisionist Western, Unforgiven is in many respects almost defiantly old-fashioned. Eastwood is deliberate, even contemplative, in his unhurried pacing, suggesting the slow, steady build of a gathering storm. And he fully understands the dramatic, thematic, and emotional impacts that can be gained simply by creating the illusion of real time passing. When Munny, Logan, and the Kid track down and shoot one of the errant cowboys, it takes a long time for him to die —long enough for at least one of the bounty-hunters to be profoundly affected, and for the audience to be shaken out of its instinctive sympathy for the nominal good guys. Later, the cocksure Kid breaks down as he fully grasps the enormity of cold-blooded murder. "It's a hell of a thing, killing a man," Munny agrees. "You take away all he's got, and all he's ever going to have." The Kid suggests that the victim had it coming. Munny replies: "We all have it coming, Kid." Time and again during Unforgiven, Eastwood shoves our faces in the consequences of violence, the horrible consequences for killer and victim. There are no true heroics here, only varying degrees of violence and self-delusion. Everything leads to a final shootout that is as terrifyingly bloody and chaotic as any ever staged for a Western. The big difference with this one is, Eastwood gives you a strong sense that this is how such things probably happened in real life, with no clear-cut heroes or villains, with dying men groaning that they don't "deserve" their fate. "I'll see you in hell," a victim warns Munny. Munny isn't moved. Hell will hold no surprises for him. Unforgiven is a great movie, and a major source of its greatness is Eastwood's (and screenwriter David Webb Peoples') sternly ambiguous view of the very things that made most of us so fond of Westerns in the first place. Indeed, after seeing Unforgiven, some people have never again been able to look at any other Western, by any other filmmaker, in quite the same way. So I had to ask: Did Eastwood think of Unforgiven as an act of self-criticism? “You mean doing penance for sins of the past?” he asked, not testily, exactly, but not altogether playfully. OK, take two: Did Eastwood think that some of his films – say, the Man With No Name movies, if not the Dirty Harry melodramas – may possibly have desensitized audiences to violence during the 1960s and ‘70s? “Maybe,” Eastwood replied, thoughtfully warming to the subject. “But at the time, it didn’t seem like a big deal. We all had grown up with films that had Jimmy Cagney shooting somebody down, or drilling somebody in the trunk of a car – and that didn’t make us all violent people. “I must say, though, that in recent years, I’ve viewed a lot of films where the violence has turned into a gruesome dismembership thing. Not very pleasant. But, then I start thinking: Am I just getting older, and I’m criticizing someone else who’s coming along, maybe doing something that [makes me feel the same way] that people felt about some of my things at some point? I don’t know. I would say that Dead Man, Ravenous, Shanghai Noon, Open Range, The Three Burials of Melquiades Estrada, The Proposition, and "Deadwood" are all proof that Eastwood didn't end the genre.